Healing Communities of Georgia is a diverse network of nonprofits, state agencies, and faith-based organizations across the state actively implementing Healing Communities principles within your community. The mission of the network is to restore returning citizens, their families, and victims of crime by facilitating needed healing from the destructive effects of crime and incarceration. The healing occurs within individuals through mercy, forgiveness and facilitating the restoration of right relationships. Healing also occurs through justice, by collectively informing decision makers of policy adjustments needed to create a more just and effective corrections system. The network is based on the principles of repentance, forgiveness, grace, and restoration – all of which are powerful tools to facilitate healing from the destructive effects of crime and incarceration. The network serves as a reminder of the commitment to victims and offenders who are in need of healing following an action that damaged their original design. Through research, the Reentry Services Unit knows that the faith community and dedicated nonprofits are a natural environment for reinforcing pro-social behaviors necessary for positive reentry. Whether through prayer, religious study, planned social activities, volunteering in the community, or simply through companionship, these organizations are able to positively affect returning citizens, their families, and victims in ways that other programs do not. Since some faith-based organizations may be reticent to become involved with this population without outside support, an excellent training curriculum was developed by the Annie E. Casey Foundation for organizations interested in mentoring this special population. The aforementioned curriculum has been successfully implemented in a number of pilot sites throughout the nation. The “Healing Communities” curriculum prepares our partners to better understand and address the challenges faced by those imprisoned and those reintegrating back into the community. Stations of Hope are faith-based organizations, dedicated nonprofits, and government agencies that are implementing Healing Communities principles within their communities and joined under a collective covenant. As a network, Stations of Hope share best practices, support each other, and work collaboratively to advocate for policy reform. 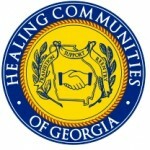 All Healing Communities of Georgia members have the ability to successfully address the direct needs of impacted citizens as individual organizations. As a network, these committed organizations are in an ideal position to address systemic issues and provide constructive feedback to policy makers by speaking collectively on relevant issues. Each advocacy topic is carefully chosen and researched by the network, as they work to build consensus among our diverse group of partners. Each advocacy issue will then be brought to the attention of policymakers during an annual ‘Day for Justice’ event that will occur throughout the state.